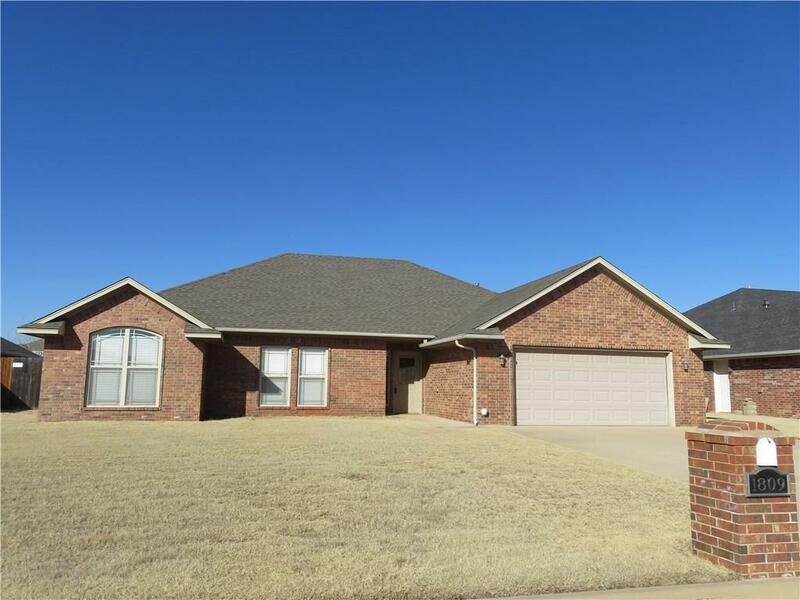 1809 Foxtail Circle, Altus, OK.| MLS# 850554 | CENTURY 21 Altus Prestige Realty, Inc.
Open floor plan with lots of storage. 4 bedrooms, 2 1/2 baths. Tile in entry, hall, baths, kitchen & kitchen dining. Carpet in bedrooms. Kitchen has stainless steel appliances. Electric range, dishwasher, microwave/vent, refrigerator & garbage disposal. Solid surface counters with tile backsplash & an eating bar. Blinds on the windows. The large living room has lots of windows for natural light, gas log fireplace with a remote start & thermostat, ceiling fan & eye ball light. A Master bath has double vanities, a whirlpool tub & a separate shower. Master bedroom has crown molding & panned ceiling with a ceiling fan. Main bath has double vanities & a large linen closet. All bedrooms have ceiling fans. Split bedroom plan. 4 & 2 have panned ceilings. Ex large entry closet. Leaded glass front door. Extra large garage, 576 sq, ft, fold down ladder w/electric opener on the insulated door. Large attic space is floored. Sprinkler system for front & back yard. Located in a cul-de-sac.